Samsung have an impressive history of rugged phones, including the Samsung B2100 and the original Samsung Galaxy Xcover. The first generation Xcover is getting a bit old now, so Samsung have refreshed it with the Samsung Galaxy Xcover 2. 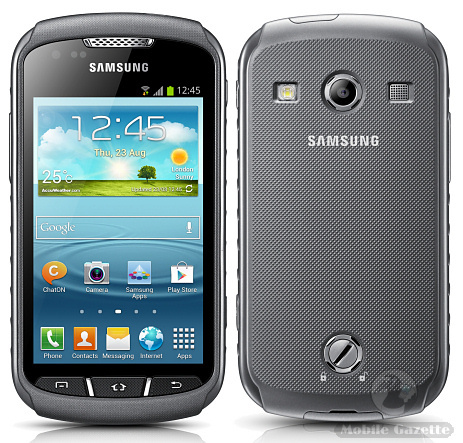 The Galaxy Xcover 2 is basically a rugged version of the Samsung Galaxy S III Mini. It features a 4.0" 480 x 800 pixel display, a 5 megapixel primary camera with a 0.3 megapixel sub-camera and a dual-core 1GHz CPU with 1GB of RAM and 4GB of internal storage. The Xcover 2 runs Android 4.1 and comes with all the usual features that you would expect to see in a Samsung Galaxy device. Of course the key selling point here is ruggedness. The Galaxy Xcover 2 is IP67 certified, so it is dustproof and can work underwater to a depth of one meter for up to 30 minutes. Although the chunky case looks somewhat shock protected, Samsung have not given any details. We also don't know if the display can cope with wet fingers or gloves, something that might be important to many customers. It's quite a bit bigger and heavier than the Galaxy S III Mini, coming in at 131 x 68 x 12mm and weighing 149 grams. Inside is a 1700 mAh battery which is quoted as giving up to 23 days standby time. Of course,the Xcover 2 supports 3.5G, WiFi and Bluetooth, plus it also supports GLONASS as well as GPS positioning systems, which is handy for an accurate fix when out somewhere wet and wild. The Xcover 2 also has a fitness application pre-installed in addition to all the standard Samsung add-ons. Samsung haven't said when the Xcover 2 will be about, but technologically this won't be a stretch for them. The pricing is unknown at present, but we would expect it to be a bit more than the S III Mini, so perhaps retailing for about €350 or so when it hits the shops.